Only Imperial Stormtr … ahem … Settlers are so precise. Imperial Settlers is a cute card driven civilisation building game. At the beginning the turns are fast and easy and before you know it you are in round 4 and a vigorous fight with your opponent who just destroyed one of your most helpful buildings. Aaaaaargh! My Empire will strike back! The card qualitiy is quite good and the artwork is beautiful. The resources are part wood, part good cardboard. Nothing to complain here. Same with the four different faction boards and the score board. Impressive, most Impressive. The game is played in five rounds and every round each player gets new cards. One from the own faction deck and the rest is drafted. A card from the common deck is layed out for each player and everybody chooses one going clockwise. Then again the other way around with a new set of cards. Then all the already played production cards (and the main player boards) produce goods which will be needed in the next Phase: The Action Phase which is the main part of the game. Going around each player takes actions which can be playing cards in different ways, activating already played cards, destroy cards (from your hand or from your opponents soon burning city) or spend workers to get resources. In the first rounds there is not much to do but later when you civilisation has become a little empire you have a lot to combine and activate everytime it’s your turn. You should use all your resources during one round because at the end of each of the five rounds all resources get discarded (exept for one special resource per faction). After five rounds the game ends and the player with the most points is the winner. Alone with the four factions in the Base set you have enough to experience to have a lot of fun. But there are more factions coming in the future. – artwork maye too cute for heavier civ-players? Thank you Ignacy Trzewiczek for a great little civilisation building game. Hope for a lot of new factions soon. Okay, that was the intro for Asterix, a french comic series. But there are a few similarities to Deus. We’re going to conquer the land, exile the barbarians and establish a great empire. But Deus is not a wargame. It’s a Resource and Hand Management game with a good portion of Engine Building. So yes, it’s a Eurogame. The components are decent. Nice wooden pieces for the resources, good quality cards and sturdy cardboard land tiles. There are only two things that might concern some players. First, the land tiles look a little strange. Some people would have liked a more realistic look but I’m fine with how it turned out. Second, the wood icons on the cards have a green color and the corresponding pieces are brown wooden discs. That really confused me and my fellow players, so I bought a pack of green discs to fix that. After the gameboard is set up and every player has their starting cards and resources the first player can play a card to his personal little gameboard. There are six different card types: maritime cards, production cards, scientific cards, civil cards, military cards and temples. Each card type has corresponding buildings in every players color. When you play a card you pay its cost, put it in the matching slot of your game board and take the corresponding wooden building piece and put it somewhere on the main game board. And now the special part. After doing this you activate the special card abilities of all the cards in that column starting with the oldest at the bottom. As you can see, the trick is to build profitable building combinations to activate more than once. If you really don’t want to play a card you can always discard cards from your hand instead (offer them to the gods (therefore: Deus)) and trigger special abilities to get more resources, buildings, money or points and draw new cards. Round after round cards are played and buildings are put on the board. When all Barbarians are defeated or all Temples are built, the game ends and the player with the most points wins. A modular board and a lot of different strategies due to different card engines that could be built provide for a lot of plays without getting boring or samey. 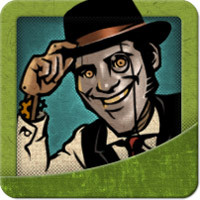 … and welcome to the card game about the great graphic novels written by Joe Hill and illustrated by Gabriel Rodriguez. The game comes with nearly 200 cards and a cardboard first-player marker. The cards are beautiful. The images of the Strength and Challenge cards come directly from the wonderful graphic novels. The Key cards have the mysterious keys in shimmering foil printed on them which looks fantastic. Every player gets 4 Strength cards and one player gets the first-player token. At the start of each round the top Challenge card is revealed and every player gets an additional Strength card. The Strength and the Challenge cards are divided in three colors (white, black and blue) and each has a number on it. Now every player in turn can choose to play, pass or search for a key. Passing means to just draw an strength card and finish your turn and when you search for a key you can trade cards from you hand for a random key which gives you useful abilities to manipulate cards or gameplay itself. But when the player chooses to play he can play up to three cards from his hand face down. If the totaled numbers of his cards (on condition that they match the colors of the challenge) and the cards of all the opponents (again while matching the color) are equal or higher than the number of the challenge, then the challenge is overcome. The player with the highest matching numbers gets the points for the challenge and the first-player token. The player with the second highest numbers gets the second place reward. If the challenge is not overcome, no one gets anything. Some cards have special abilities and give you a reward when the challenge failed, allow you to steal something from you opponents hand or even count cards to the total even if they have different colors. So it’s a game of permanent bluffing and guessing. This is a game that can be played over and over again without getting boring too fast. Anytime you loose you wanna play again and win this time while trying a different strategy and maybe getting better keys. Nice and fast game. I really like the theme and the game got me started in the graphic novels. Some of the pictures on the cards spoil things happening in the story but it is not as bad as I thought. … the great old ones will return. And that’s exactly where you as a player enter the stage. You are one of the people that investigate the strange events happening in the Miskatonic University Museum. It is your responsibility to stop the monsters and solve the many mysteries that surround this place. Elder Sign is kind of a smaller and easier version of Arkham Horror. Appropriately enough it does not cover the whole city of Arkham but rather takes place in a museum there. The game comes with a lot of different sized cards, a cardboard clock, a bunch of beautiful customized dice and a lot of tokens. The whole content is of very good quality as everything from Fantasy Flight Games. The Artwork is great and supports the flair of the story. Unlike Arkham Horror this game does not have a game board. Here you just put down six cards from the deck of adventure cards. These cards represent the different locations in the museum with tasks on it. Each turn you can move to one of the rooms with your character and try to solve these tasks. If you can fulfill them you get a reward (for example: weapons or if you have luck even an Elder Sign). If you fail you have to suffer the penalty effect (most times lose health or sanity). And the end of every players turn the clock has to be advanced 3 hours forward. If it strikes midnight the current player has to draw a mythos card which has an instant effect and an ongoing effect on it. The investigators have to solve room for room to find better weapons and hopefully enough elder signs to stop the ancient one to appear. If they don’t stop him before he awakens they have to fight the ancient one in battle. But most times this doesn’t end well for our heroes. Learning Elder Sign is not that hard compared to Arkham Horror but a little harder than the average casual game I guess. The game is partially luck driven concerning the continual dice rolling. But as you can decide which tasks you go for and which weapons, spells and abilities you use the game has enough tactics involved to let you change the games outcome due to your own decisions. By the use of 16 different investigators, 8 different ancient ones, 48 different adventure cards (locations) and a whole bunch of weapons, spells and allies there is nearly no chance that you ever have the same game again. For Lovecraft Fans this game should be a definitive buy (as Arkham Horror is too). It’s quite easy to learn and provides a well themed adventure. If you are just searching for good games to play solo (as I was when I got this game) I can also recommend it. The only ones I would advice not to buy it are gamers who don’t like dice games or games with to much luck involved. I would set the luck/tactics rate somewhere at 50/50. Star Fluxx is a variant of a game simply known as Fluxx. The rules are nearly the same (except for the creepers) and just the theme is another one. Where the standard Fluxx had everyday life objects and goals … Star Fluxx has (as the name tells) a funny space theme with lots of references to Star Wars, Star Trek, Dr. Who and much other Sci-Fi stuff. But what is Fluxx or in this case Star Fluxx exactly? … let’s have a look. The game comes in a little box with 100 cards and a piece of paper containing the rules. The cards are of good quality and will survive a lot of games. For playing the game you don’t necessarily need to read all the rules. Everything you need to know is written on the cards. Just place the starting rules card in the middle and deal everyone three cards. Then start playing. The starting rules are: Draw one card, Play one Card. GOALS are played in the middle of the table and when someone has the matching KEEPERS (or sometimes CREEPERS) he wins the game. CREEPERS are bad for you the most times. When you draw one you have to play it immediately and as long as you have it you can’t win (unless the actual goal says otherwise. So most times the game is just drawing cards and playing cards. Trying to get Goals matching your Keepers in front of you. It’s mostly luck driven with a very, very little amount of tactics. As every game has other goals and other card combinations you draw it’s replay value is quite okay. But when you have a problem with games that are playing you instead of you playing them then you will try it once and never touch it again. I understand why someone can dislike this game. It offers no possibility for tactics and much thinking. But I for myself kind of like it for playing during lunch breaks. When you know all the cards it’s a really fast game and you can just fight your opponent in a quick card battle. And as a bonus: Sci-Fi Fans will find a lot of fun references. … follow any of them. It’s Time for some creativity and story telling! I was interested in this game because of it’s beautiful artwork but I really could not say if that game was something for me. The game comes in a box which at the same time is the game board for counting your points. In addition there are six cardboard tokens and one nice colored wooden rabbit for each player. The only other thing that comes in the box is a package of 84 tremendously beautiful illustrated cards. These oversized cards are the centerpiece of the game and the pictures on them are colorful, creative and ambiguous. Why ambiguous? Let’s see while discussing gameplay. Each player gets a bunch of cards to their hand and the one player goes first. He then chooses one card in his hand and tries to describe it somehow. Maybe with a word, a sound, a sentence or a gesture. There are no restrictions. But he should only describe it vaguely. Then he puts it face down on the table. Every other player then chooses a card from their hands which matches the description as good as possible and put it on top of the first players card. The cards get shuffled up and everybody but the first player try to guess the original card. The first player doesn’t get points when everybody guessed his card or nobody guessed his card. In every other case he gets points for each guess on his card. Every other player gets points for other players who guessed their card. So altogether Dixit is a game of creativity and seeing things in pictures not everybody sees or everybody sees different. And that’s when we come back to the ambiguousness of the cards. There are a lot of cards with pictures that can mean everything. For example: On one picture someone will see an old tree. But wait … the tree has a face .. and arms … and holds flowers in his hands … and looks a little bit like aunt Maggie or uncle Steven (or both .. who knows). So every card can be used with multiple stories behind it and description given. Your task is to find the right one for your cards to get the most points. The replayability is quite high because the pictures deliver the potential for so many stories. But maybe when playing with the same group over and over again it can get to this point where creativity is fading and you don’t want to use an already used description again. But for that there are a few expansions available with a lot of new pictures. I played this game a few times with my family and they are not really into gaming that much. But they loved it and even wanted to play it again and again. But it’s equally fitting for every gaming group. So if you are searching for an easy to learn game … take this one. I highly recommend it. And if you are not convinced by now … go and watch the Dixit episode of Will Wheaton’s Tabletop! This was the first Deck Building Game I played. Even though I watched a lot of playthroughs and reviews of other Deck Builders Star Trek was one I liked better than the most. First reason of course was being a Star Trek TNG fan in my youth. Second reason was the possibility to have really different scenarios in this game. But more to that in the Gameplay section. When I bought this game I actually wanted to buy the First Edition of this game but it wasn’t available. So I tried my luck with this one. The box comes with 300 cards in good quality and really nice pictures from the TV Show and the movies (First Contact for the Borg Scenario). To sort your different decks of cards there are a few cardboard and foam dividers within the box. In addition you get five 20-sided dice to keep track of your ships damage. Everything is of high value and there is enough room for some expansions left. You start with a few common crew members and standard maneuvers in your deck. Throughout the game you will get to buy new crew members and more powerful maneuvers and setups from the Star Base. New ships however you will only get when you start exploring space cards from the space deck and using diplomacy to get these new starships. But beware, most times you will be facing different things when exploring the space deck. Missions, Events or Battles. Be sure to have a good crew in your hand to play when things go bad. What I really like about the Star Trek Deck Building Game are the different scenarios you can choose to play. The standard exploring and mission solving scenario is one where you can slowly build your ship and crew and then try to go on missions and score points. Ok, you have to be faster than your opponent but there’s not to much pressure there. A different kind of scenario is the one against the Borg. Here you have to work with the other players to fight the Borg Cards from the space deck which strike every turn and get stronger with every Borg Card you defeat. In the last scenario about the reunification of romulans and vulcans you split in two teams. One side tries to reunify and bring peace while the other side tries to sabotage the whole attempt. For now I never played this scenario but it sounds really interesting when playing with more than 2 players. Through your decisions which characters you choose to buy your deck will offer you a variety of different strategies. With the three different scenarios even more change comes to the came. This game alone has good replay value but as you can combine it with the first edition with complete different cards and three other scenarios the replayability even gets bigger. For solo players this box may not really be the best thing to buy unless you have no problem with playing against yourself with two decks. I tried the Exploring scenario for example and without an opponent there is no challenge. You build your crew to perfection and win every mission later. But as soon as you play with two or more players it really is a lot of fun. For my personal playing experience I like co-op better than battling against each other but that’s my opinion in most of the games. So if you are a Star Trek Fan and/or like Deck Building Games or even just want to start with Deck Building Games I can recommend this game. It’s quite easy to learn and offers fun and variety for a lot of plays. For the beginning I have to say: Getting this game here in Germany was really a pain in the a…! Because of the licensing of Upper Deck it is not available in Europe and I had to order it in US with quite high shipping costs, taxes for the import and few weeks of shipping time. But enough of that. Finally it arrived and I was able to play it. An what can I say. It is as good as I hoped it would be. Unlike most other Card Games/Deck Building Games it comes with a board which makes playing a lot nicer and more fun. The board of good solid material and not too overloaded with graphics and text. Just enough to know where everything goes and what to do. The art on the cards is beautiful and as far as I know specially designed for this game. The cards themselves seem to be a little thinner as cards in other games but still very good quality. I don’t want to explain all the rules here so I’ll make it quick. In a normal 2-5 player game you choose 5 heroes from the 15 who come in the Box, an evil Mastermind, villain groups and a scheme for the Mastermind. As in all deck building games you start with a bunch of weak common cards in your deck (staff of S.H.I.E.L.D) and as time passes by you can afford and buy real heroes. Every turn a villain card gets turned over an most of the times this means a villain enters the board and starts his rampage through the city. As you get better cards you are able to fight these villains, stop them from escaping the city again and maybe even attack the evil Mastermind controlling these monsters. After attacking the Mastermind 4 times (and of course winning these attacks) you defeat him and victory is yours. The game comes with 8 different schemes which all have a different influence on the the winning or losing conditions, the difficulty and even the gameplay. One last thing: Unlike in other deck building games a hero is not just one card. For example Iron Man consists of 14 cards which represent different kinds of his abilities. So during your turn you aren’t playing Iron Man itself as a one card but you are playing different moves he does during a battle. This gives the feeling of a great teamwork when different heroes do “their different things” in the battles. Because of 15 different heroes, 11 different villain/henchman groups, 4 Masterminds and 8 schemes which all can be mixed there is an uncountable number (ok, i’m just too lazy to do the math) of varieties to the game. This gives a great Replay Value and no game should be like any other. As you can see in my review I really love this game. I’m a fan of the Marvel Universe and being able to play these heroes and fight super villains is a lot of fun. If you are a fan of Marvel Comics and/or Deck Building Games I highly recommend this game for you. I hope Upper Deck won’t wait too long until we see an Expansion for this game with more heroes and more great villains. If you’re not sure if this game is for you or maybe you a short of players in your group, there is a way to play this game online with gamers from all over the world. In our games we felt that it is a little to easy for the inspector. So we decided not to turn the character markers after the end of the round. So the inspector has to remember all the suspects in his head. But beware: Mr. Jack has the same problem. When you have a keeper stealing card and your opponent has the computer in front of him. Take it! (unless another keeper gets you to win the game.) The Computer is the best card in the game. It let’s you draw and play more cards and enhances you hand and keeper limits. When you cannot get it … maybe you can shift the malfunction creeper to the opponents computer to shut it down. As these two games are from my list, I reviewed them for you. It’s me this week! Yay. Got my fresh copy of Takenoko and will play it a few times I think. In addition we have planned to play a game of A Study in Emerald. We will have a few buddys around and play Lords of Waterdeep. And maybe a little Marvel Dice Masters again. Will play a little StarWars XWing and Eldritch Horror with Friends. Got my copy of Sentinels of the Multiverse and sleeved a lot of cards. Time to test it! “Flash Point Fire Rescue” and “K2” just arrived. Will try them both this weekend I think. Played a little Dixit and Telestrations with the family. Mansions of Madness with friends and Hanabi. I'm a Gamer from Germany. At the Moment I like Deck Building Games and Marvel Legendary is my Favorite.